The Guerrillas enter this game ranked 2nd in the league in points (84.0) per game and it will be a challenge for the Red Devils to slow them down. The Guerrillas are led offensively by Dajon McKnight (20.3 PPG) and Mike Bundy (19.0 PPG). McKnight and Chris Maher (18.0 PPG) are matchup nightmares with their combination of size and scoring ability and the Red Devils will need a game plan to limit their influence on the game. The Red Devils are second in the league in three-point attempts (30.8) per game and will need to be hitting their three’s in order to defeat the Guerrillas. Ben Davis (4.3 3PM) and Paul Olson (2.0 3PM) are two of the Red Devil shooters that can potentially have big games. In the end, I think the Guerrillas pick up another win. The Aardvarks have been on a roll and enter Week 5 as the only undefeated team. They possess the top scoring offense (84.0 PPG) in the league and shoot a remarkable 53 percent from the field. Adam Hoven leads the league in assists (8.8) per game and is the orchestrator of the offense. Thomas Hoistad is second in the league in points (20.8) per game and is a dangerous threat from beyond the arc. The Loons are second in the league in points allowed (62.5) per game and can make life difficult for opposing offenses. Tom Anderson leads the team in points (19.3) per game while Mike Ratelle paces the team in rebounds (8.3) and assists (5.5) per game. I think the Loons can give the Aardvarks some fits, but not enough for the victory. The Muskies picked up a big win against the Rebels in Week 4 and will look to add another one in the win column. However, the Lightning showed some spark on the offensive end last week and are not to be taken lightly. The Muskies rank third in the league in scoring (73.7), but are last in points allowed (77.0). They’ll need to tighten it up on the defensive end in order to continue their winning ways. Glen Fair leads the team in scoring with an average of 19.0 points per game. Sonny Young-Graves is third in the league with 3.7 3-pointers per game and the Lightning will have stick tight with the Muskies’ outside shooters. The Lightning are led by Jake Gave, who is averaging 15.5 points and 9.5 rebounds per game. Chuck Harvey hit six of eight 3-pointers in Week 4 and his outside shooting will be relied upon once again. I think this game finishes with another Muskies victory. The Free Agents picked up their first win of the season and will face a Player’s Club side that will be eager to break their current losing streak. It was a nail-biting finish for the Free Agents in their Week 4 victory and they showed marked improvement on the offensive end. They shot 46 percent from the floor and gathered 12 offensive rebounds. Vernon Simmons led the way with 14 points and received a big double-double from Matthew Bertsch. The Player’s Club have lost three straight games, but aren’t far away from wins in a couple of those games. Tony DeBoer and Steven Kelsey each average 15.8 points per game to lead the offense. They’ve been solid defensively, ranking fifth in the league in points allowed (67.5) per game. I think the Player’s Club step up and gets the win in this matchup. This will be the second game of the night for both of these teams. The Free Agents will have to step up defensively and defend the 3-point line in order to defeat the Muskies. They must also limit their turnovers that can potentially lead to easy baskets for the opposition. The Free Agents had some success crashing the offensive glass and the Muskies must be cognizant of that and block out their man. 3-point shooting will also be important in order to match the firepower of the Muskies. In the end, I’ll pick the Muskies to win. The Rebels will be looking to bounce back from their first loss of the season as they take on THEM. The Rebels weren’t at their best defensively the previous week, but still lead the league in points allowed (59.5) per game. They play an aggressive style of defense that also forces turnovers -- they lead the league in steals (8.3) per game. Ryan McGuire (18.3 PPG) and Cody Heinz (17.0 PPG) are the scoring leaders for this team and can put the ball in the hoop in a number of different ways. 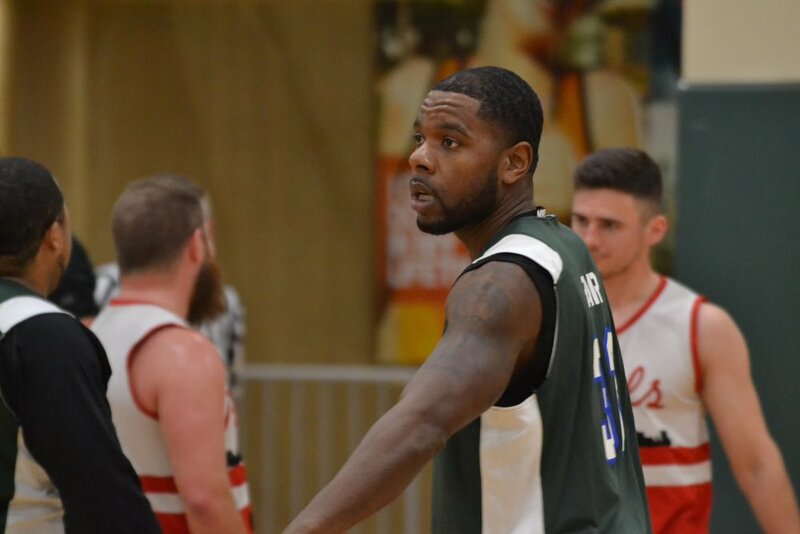 They’ll have to game plan to slow down Devin Stensrude, who leads the league with 25.8 points per game. Stensrude can light it up from outside and they have to deal with Sam Hanson (14.0 PPG) down low as well. THEM will have to careful with the basketball and limit turnovers that can lead to buckets on the other end. I think this will be a close one that the Rebels ultimately win. After Week 4's Massacre Loss, can All or Nothing Bounce Back?